Despite globalization, Brazil internal music market has seen a meteoric increase in popularity of regional rhythms during this period, mainly sertanejo. Actually, sertanejo is Brazilian audiences‘ preferred music genre . No one can deny that Brazil is a country with a powerful musical history. Going through all its music repertoire while preparing this series of articles, I can’t help but admire even more its distinct and perennial beauty. Are things changing though? Is Brazilian music going through a phase of decadence? This is an ongoing debate in the country nowadays… Many music critics are definite: today’s consumer society –they believe- leads to “consumable music”; moreover, they blame the universal predominance of sertanejo as responsible for the lack of musical diversification nowadays. “We always had good music and bad music in Brazil -says one critic- but there was a balance. At this time, at least 90% of what record companies release is totally disposable”. Some go even further and state that pagoda, sertanejo and electronic forró are “a tsunami of musical trash unprecedented in the history of Brazilian music”. Other critics are more optimistic. Véronique Mortaigne, writing an article in The Guardian, states that: “Brazil is surfing a musical new wave that is now reaching Europe”, making emphasis on the quality of certain musicians’ work “not afraid to mix the old and the new, irritating a few purists along the way”. The debate could go on forever. What is certain is that there are still many bright examples of fine Brazilian music. Check out my list with some of the most remarkable songs of the 2000-2010s, go ahead and “Brazilify” your playlist! She became worldwide known after the release of her amazing album Tanto Tempo. This particular song was written by Vinicius de Moraes and Baden Powell; it was featured in the movie Eat, Pray, Love. Read more here. This psychedelic anthem was composed by the iconic band Os Mutantes in 1970; it was listed by Rolling Stone Brazil as the 50th greatest Brazilian song. Of the many re-recordings the song has had, I like this one, by the Belo Horizonte band Pato Fu. Known for his intellectual and controversial lyrics, rapper Gabriel o Pensador (“Gabriel the Thinker”) stepped into the limelight with his provocative composition “Tô Feliz (Matei o Presidente)” [I’m Happy (I killed the President)]. He has had a highly successful career since then, topping often the charts with his gold or platinum-certified albums. Até Quando? (“Until when?”) was released in the album Seja Você Mesmo (mas não Seja sempre o Mesmo) (“Be Yourself (but not always the same”). Its compelling lyrics address the issue of conformism. It was highly praised by most critics and received an award at Brazil’s MTV Video Music Awards. Cássia Eller is one of the most successful pop singers/composers in Brazil. Owner of a distinctive contralto voice, she was rated as the 18th greatest vocalist by Rolling Stone Brasil. This beautiful song was composed by Nando Reis and was included in the live album Acústico MTV, where she sings it together with Reis; it is Cássia’s final album before her death on December 29, 2001 at 39 years old. 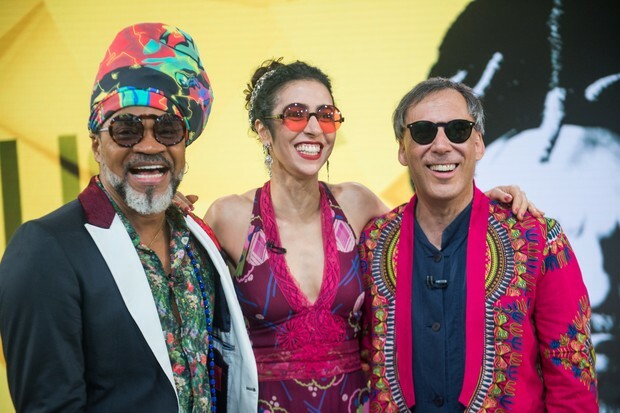 Tribalistas is a Brazilian musical supergroup consisting of Arnaldo Antunes (ex-Titãs), Marisa Monte and Carlinhos Brown (Timbalada). Their debut collaboration resulted in the popular album Tribalistas, which attained considerable popularity in Brazil and Europe. The curious thing with this popular group is that, despite their great success, they have rarely performed together, deciding to go on a world tour just now in 2018. Among their most popular songs are “Já Sei Namorar” (included on the video game FIFA Football 2004), “Passe em Casa“, “É Você” and “Velha Infância“, played on the Brazilian soap opera Mulheres Apaixonadas. From Marisa Monte to Elizeth Cardoso, from Paulinho da Viola to Francisco Alves, from Elis Regina to Marcelo Camelo, dozens of artists made their impassioned interpretations of “Carinhoso”; one of my favorites is this one, by Marisa Monte and Paulinho da Viola. Zeca Pagodinho is a singer and songwriter considered a great name of the genre samba and pagode. He has recorded more than 20 albums and has become immensely popular, not only due to his irreverence and jocosity, bur mostly due to his rare talent, praised by critics and consecrated artists. This song gives name to his 2004 album Deixa A Vida Me Levar (“Let life take me”), it was extremely successful, becoming double-platinum certified. The berimbau is a single-string percussion instrument. Originally from Africa, it was eventually incorporated into the practice of the Afro-Brazilian martial art capoeira. The instrument became worldwide known for being the subject matter of this song, which belongs to Baden Powell and Vinicius de Moraes. Maybe one of the most famous versions of “Berimbau / Consolação ” is the one performed by Toquinho and Maria Creuza in 1970; nevertheless I love this version, featured in Sergio Mendes’ 2006 Album Timeless, with the participation of his wife, Gracinha Leporace and iconic American artist Stevie Wonder. Award-winning, chart-topping singer, composer, and novelist, Vanessa da Mata got her start writing songs for artists such as Maria Bethania and Daniela Mercury. Despite the strength of her voice, it took her several years until she finally decided to record her own material, releasing her self-titled debut in 2002. It was her next album, Essa Boneca Tem Manuel, however, that really pushed her into the limelight, aided by the strength of the single “Ai Ai Ai“. Three years later her third album, Sim, was released. Sim spawned the hit single “Boa Sorte/Good Luck“, a duet with Ben Harper, which peaked at number one in both Brazil and Portugal and was the most played song in Brazilian radio stations in 2008. Criolo is a rapper and soul singer. With a career starting in 1989, he originally got a reputation as one of São Paulo most important rappers. After the release of his second album, “Nó na Orelha” (Knot in the ear), he saw his popularity grow beyond São Paulo to all Brazil and abroad, leading to a successful worldwide tour. He has been characterized as “ the most interesting and unruly representative of the Brazilian new wave”. “Nó na Orelha” mixes rap, afrobeat, hip hop, reggae, samba and brega. It received positive reviews and was considered the best national album of 2011 by the magazine Rolling Stone. From this album, “Subirusdoistiozin” (Two-Old-Guys-Died) is the most popular track; it describes the general waywardness of favela street culture. Multi-awarded singer, composer, instrumentalist, and producer, Marisa Monte is considered one of Brazil’s greatest singers; in fact, Rolling Stone Brasil listed Monte as the second greatest singer of all time after Elis Regina. She also has two records (MM and Verde, Anil, Amarelo, Cor-de-Rosa e Carvão) among the 100 best albums of Brazilian music. Ainda Bem (“Just as well”) belongs to her highly praised eighth record O Que Você Quer Saber de Verdade (“What do you really want to know”), was considered by Billboard Brasil the best album of 2011. Originally, “Ainda Bem” was composed by Marisa for Italian singer Mina, who included it in her 2011 album Piccolino. An emblematic representative of the forro music genre, Dominguinhos has had success as a musician, both solo and as a sideman for consecrated artists like Luís Gonzaga, Caetano Veloso, Gilberto Gil, Gal Costa, and Maria Bethânia. But also as a composer, he has produced hits recorded for some of the most important Brazilian artists; he has also written cinema soundtracks and has won four Prêmio Sharp Awards. This is one of his biggest hits, composed in 1941. Initially instrumental, it was later re-recorded by Gilberto Gil, who wrote its lyrics. The song has received countless recordings and has been included in the soundtrack of several films and soap operas. The original version is beautiful; this version though, by Dominguinhos himself together with the great Brazilian bassist Arthur Maia, it’s just beguiling. Adriana Calcanhotto is an MPB (Brazil popular music) singer and composer revealed in 1990, who has had great success in Brazil and helped bring MPB back to the hit parade after the 1980s’ Brazilian rock period. Felicidade (“Happiness”) was written in 1947 by the great samba-canção composer Lupicínio Rodrigues; it was re-presented to Brazil by Caetano Veloso in 1974 who made it widely popular. Calcanhotto included it in her fourth live album Loucura (“Madness”), which is a tribute to Lupicínio Rodrigues. Tiago Iorc is one of Brazil’s new talents. Singer-songwriter and record producer, with his debut album Let Yourself In, he gained notoriety after several of Tiago’s songs were featured on major Brazilian primetime soap operas, TV ads and films. Let Yourself In was also released in Japan with great success and in South Korea, where the public granted Tiago a Best Foreign Artist Award. In 2017, he partnered with the incomparable Milton Nascimento (who declared being Tiago’s fan) and recorded some songs for the purpose of a national tour. This exquisite song (“Nothing more beautiful”) is the result of this partnership.